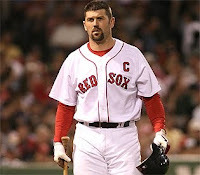 BAseball Reality Tour: Varitek Valued? In the expected news of the day department, the Red Sox will not pick up Jason Varitek's option. Jason Varitiek has five days to exercise his $3 million option (plus $2mm incentives) to return to the Red Sox as co-catcher with Victor Martinez. In about half a day, he will likely decide to return to his position of Captain of the Red Sox. Is Boras still his agent? Wouldn't this be an exciting time for his agent to pull off some nearly-tampered deal to get his client a well-payed, two-year deal? It would be fun to see Red Sox fans freak out and bash their long-time leader if he bolted for Torre & Mattingley's Dodgers to be co-catcher with Russell Martin. The heart and soul of so many Red Sox squads could join forces with Yankee legends on the blue pinstripes of the West Coast. It doesn't matter. I don't think Varitek has that much to offer while standing in the batter's box. I just wanted to throw out my own hot stove rumor, in the spirit of terribly far-fetched rumors that have no basis in fact. In an unexpected bit of reporting, an anonymous source added, "no comment." Sadly, Varatek is just the type of past-his-prime, once impactful now injury prone player that Omar loves to over-pay (see Luis Castillo; Carlos Delgado and Moises Alou).